The Roman Forum, the Leaning Tower, the Piazza San Marco: these are the sights synonymous with Italy. But such landmarks only scratch the surface of this magical country's offerings. In See You in the Piazza, Frances Mayes introduces us to the Italy only the locals know, as she and her husband, Ed, eat and drink their way through thirteen regions--from Friuli to Sicily. Along the way, she seeks out the cultural and historic gems not found in traditional guidebooks. Frances conjures the enchantment of the backstreets, the hubbub of the markets, the dreamlike wonder of that space between lunch and dinner when a city cracks open to those who would wander or when a mind is drawn into the pages of a delicious book--and discloses to us the secrets that only someone who is on intimate terms with a place could find. 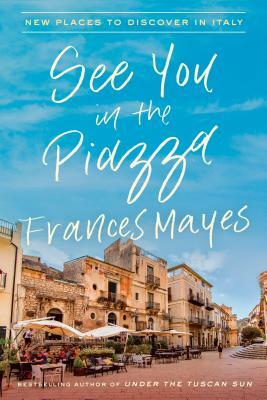 FRANCES MAYES is the author of seven books about Tuscany, including the now-classic Under the Tuscan Sun--which was a New York Times bestseller for more than two and a half years. It was followed by Bella Tuscany and two illustrated books, In Tuscany and Bringing Tuscany Home. She is also the author of two novels, six books of poetry, and The Discovery of Poetry. Her books have been translated into fifty-four languages.